NOTE: Here I Stand was due for a reprint in 2017, but with October 31, 2017 being the 500th anniversary of Martin Luther's posting of his 95 Theses, Ed Beach and his team of Here I Stand enthusiasts have put together a series of enhancements to the original game that transform this reprint into a deluxe 500th anniversary treatment. 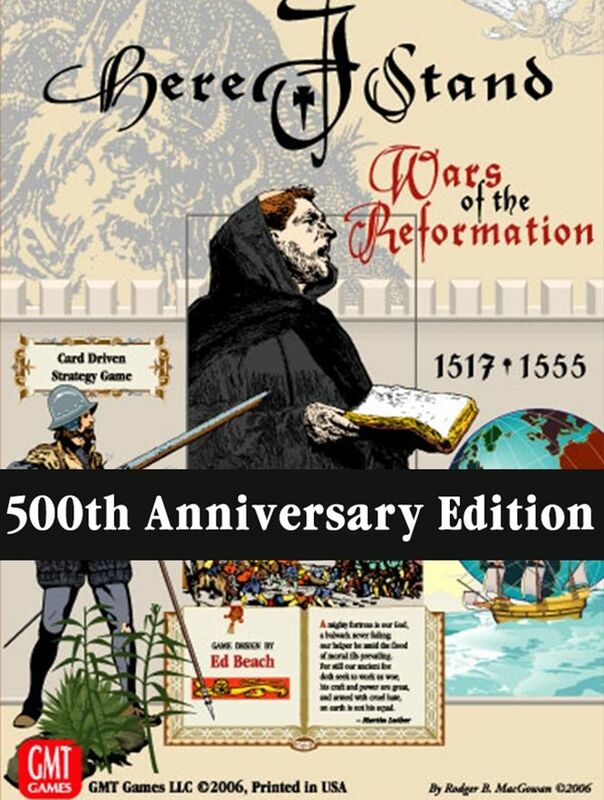 · 6 brand new cards added to the deck, including Thomas More, Thomas Cromwell, Rough Wooing, and Imperial Coronation. · Revisions to over 15 existing cards including Copernicus, Master of Italy, and Machiavelli to allow for more exciting in-game play and additional possibilities for diplomatic deals. · A new Chateau construction table is now used to resolve France's Patron of the Arts home card plays. · Several Virgin Queen rule updates are incorporated back into Here I Stand, affecting minor power activation, piracy, space trading, and foreign wars. For those of you who already have a P500 order in for the Reprint Edition of Here I Stand, your order is still good - you'll just be getting an upgraded version of the game for the same P500 price. And for those of you who want to order it on P500, we're keeping the same pricing as the previous reprint version, but giving you more value! So order away!